Since President Trump announced his candidacy in 2015, commentators have asked whether he really understands the office. Over the last few tumultuous months, some have concluded that he does not. But another way to understand Trump’s presidency is as a throwback to a previous era: Trump is — in some ways — a normal 19th-century president; the issue is that he’s serving in the 21st century. Nineteenth-century presidents are the ones that, with a few exceptions like Abraham Lincoln and Andrew Jackson, most people can’t remember or recognize. In terms of political outlook and accomplishments, they are a somewhat diverse lot, but several factors tie these men, and the way they approached the presidency, together. The presidency changed dramatically in the 20th century; the modern presidency is big, designed to deal with the challenges of an expansive federal government and an interconnected world. But in the 19th century, the presidency was a smaller office, with less of a policy role. Presidents’ staffs were nothing like the thousands of employees who now make up what some call the “presidential branch.” The U.S. played a smaller role in global politics than it does now, and the president played a smaller role in American political life. One of the defining features of the modern presidency is that the president is at the center of the policy show. Modern presidents have exercised considerable influence over the nation’s policy agenda and the legislation Congress considers and passes. They also communicate with the nation about their policy priorities — we see this, for instance, in the evolution of the State of the Union, which started as a written message to Congress and has become a nationally televised speech. But when the Constitution was written, it wasn’t necessarily designed to give presidents this kind of sway over domestic affairs. The tools for policy influence that presidents now have, such as the Office of Management and Budget, didn’t used to exist. 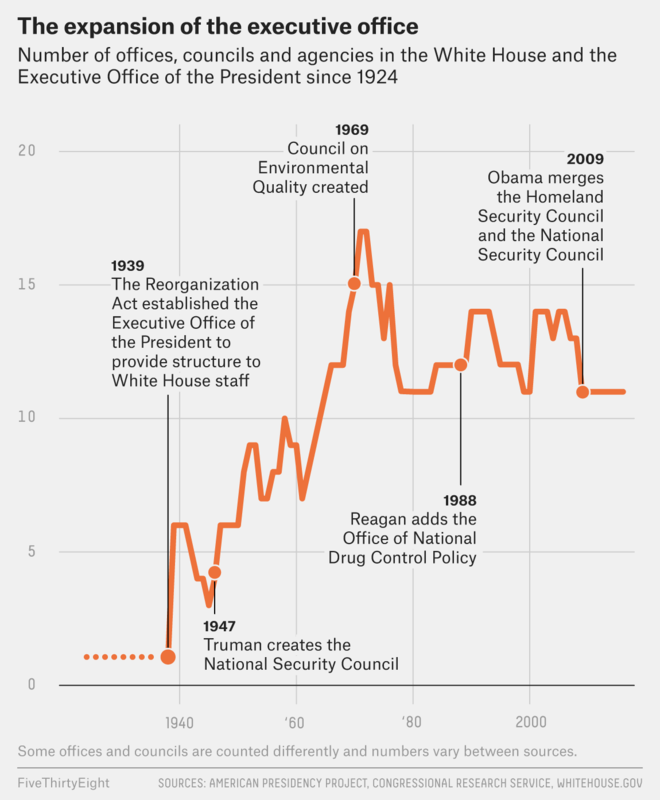 The Executive Office of the President was created in 1939, and since then it has been expanded to include a number of policy advisers and organizations that provide support for the president regarding all sorts of domestic and foreign policy issues. The extensive policy resources of the modern executive branch help make the president an active partner in policy-making. This includes not only implementing laws once they are passed, but also participating in the crafting of legislation. Policy-making was much more Congress-centered in the 19th century. The clearest examples of this are probably from the 1850s, when presidents Zachary Taylor and Franklin Pierce left the difficult task of dealing with the growing crisis of slavery to Congress. (Illinois Senator Stephen Douglas urged Pierce to support the Kansas-Nebraska Act of 1854, which he eventually did – rather than the other way around.) After the Civil War, presidents grew less passive, but members of Congress still asserted their own agendas on issues like tariffs and currency — the big economic questions of the time. Presidents were more likely to be led by their parties than to lead them. So far, Trump has mostly followed the 19th-century model, even if that wasn’t exactly his intention. Despite his clashes with Senate Majority Leader Mitch McConnell over health care, Trump has not shown an interest in the details of policy. He hasn’t fully staffed the executive branch and hasn’t appointed staff or Cabinet officials with a lot of relevant policy experience. This reflects older patterns in which the national government was smaller and did much less, and presidents didn’t have the extensive professional staff they have now. It’s not too hard to see how this is incongruous with the demands of the modern presidency. The federal government is now involved in far more areas of policy, including labor policy, health and safety regulations, education and the provision of a social safety net. (The federal government’s role in disaster-relief efforts has also expanded in the modern era.) And it’s not just about the president setting the policy agenda. Congress can make the laws, but it still needs the executive branch to enforce them. Lincoln’s Gettysburg Address was simply an invitation to “say a few words” at a cemetery dedication ceremony. This is one of the big differences between modern presidents and those from earlier eras. While 18th- and 19th-century presidents commented on the major issues of their day, sometimes drawing on moral and religious appeals, this usually took place in speeches that had already been scheduled for other purposes — like an inaugural or farewell address. Presidents, and their particular values, weren’t omnipresent in Americans’ lives in the way they are now. Even Lincoln’s Gettysburg Address, which described the moral purpose of the Civil War, was simply an invitation to “say a few words” at a cemetery dedication ceremony. In contrast, televised national addresses and in-person remarks have become a standard way for modern presidents to respond to a tragedy or crisis. Trump’s approach has been different. He seems to prefer addressing the public through Twitter and campaign-style rallies over the conventional prime-time address. Twitter obviously didn’t exist in the 1850s, but Trump’s preference for partisan media is also a throwback to older practices. And he hasn’t harnessed the moral power of the office, to say the least. This was perhaps most evident in his initial statement and subsequent press conference following the violent confrontations in Charlottesville, Virginia, on Aug. 12, which (directly and indirectly) led to three deaths. Trump drew criticism from across the political spectrum for his references to violence “on many sides” and his mention of his family’s winery in Charlottesville. His next chance at non-political leadership will come on Tuesday, when he’s scheduled to visit areas of Texas hit by Hurricane Harvey. Opting out of moral leadership turns out to be a serious departure from modern presidential norms. Political scientist Colleen Shogan has argued that “all contemporary presidents now labor under the demands of lofty presidential rhetoric and moral leadership,” to the point where such rhetoric starts to lose its bite. But in its absence, we may start to see why it matters for a large, diverse country to have a single person articulating widely shared values and goals. Modern presidents have dealt with greater global pressures than their earlier counterparts did. As the U.S. became a world power during and after World War II, trade, diplomacy and international intervention became part of the suite of policy issues that commonly made their way into the Oval Office. As with domestic policy, institutions have developed in response to evolving expectations. The National Security Act of 1947 created the modern security state, establishing new agencies for intelligence, a consolidated Department of Defense and a National Security Council to help presidents manage foreign affairs. Trump’s turn away from ideas like promoting democracy and protecting human rights breaks with many decades of foreign policy ideas, from both Republicans and Democrats, that incorporated those goals alongside protecting national interests. It also leaves a great deal of uncertainty about what Trump’s foreign policy will look like going forward. The office of the presidency has changed a great deal and in innumerable ways, including undergoing efforts to formally separate politics from executive branch service and becoming subject to new expectations about how presidents will speak and lead. It changed, in part, because presidents themselves sought to expand their power and influence. It’s possible that Trump can transform the job into something different, altering public expectations and the office’s guiding values. But there’s probably no going back. So far the mismatch has mostly brought Trump political trouble, with low approval ratings and few legislative accomplishments. At the same time, Trump leads a party that has long advocated, at least on paper, for a smaller federal government, something that is compatible with a 19th-century approach to the Oval Office. If Trump can’t sell the public and his fellow party members on his presidential style, however, he may face the same fate as 19th-century presidents like Millard Fillmore, Franklin Pierce and Chester Arthur: a challenge from within the party the keeps him from serving a second term.